Ballooning made possible man's first flight over 120 years before the Wright Brothers flew. The first manned hot-air balloon was built by the Montgolfier Brothers and flown by Pilatre de Rozier and the Marquis d'Arlandes on November 21, 1783, in France. The balloon envelope was paper and the fuel was straw. Michael's Rainbow lifts off with another balloon - click to enlargeAt the turn of the century, the smoke balloon (envelope heated by a smoky fire on the ground) was a common county fair opening event. After the initial climb, the hot air cooled and the rider would jump from the balloon. At that point, the balloonist would pray that his parachute would open. Today's flights are not so melodramatic. 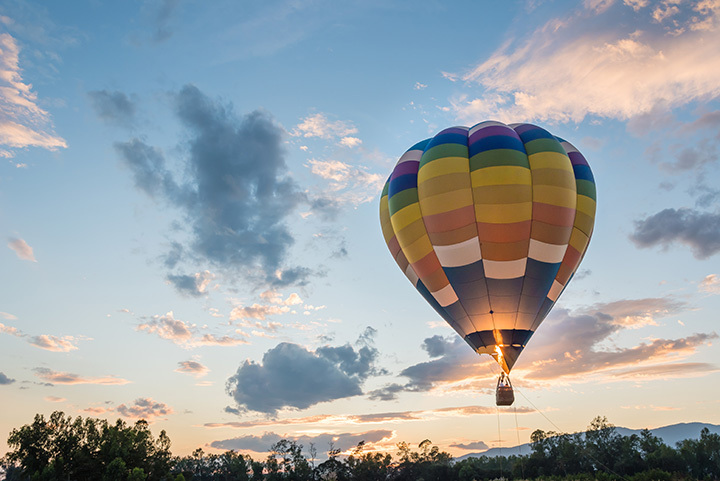 Modern balloon technology makes it one of the safest means of flight and the gentle skyward float of a balloon is always a calming experience. Our state-of-the-art balloons, Michael's Rainbow II & III, hold respectively 77,500 & 105,000 cubic feet of air, and stand approximately 66 feet tall with a diameter of approximately 60 feet. Cold inflation of the envelope - click to enlargeDawn liftoff - click to enlargeThe launch procedure begins with a cold inflation of the envelope - the balloon is laid out on the ground and a large, powerful fan is placed at the opening. Next, the burner is pointed into the balloon and heats enough air to lift the balloon into a vertical position. Passengers board the basket and after a final systems check, the balloon lifts off. Chase vehicle - click to enlargeDuring your flight, the chase crew follows on the ground, keeping in radio contact and meeting the balloon upon landing. After the balloon and basket are packed up and stowed, you are transported back to your vehicle.